The simplest sweet treat of all for everyone asking for easy baking recipes? 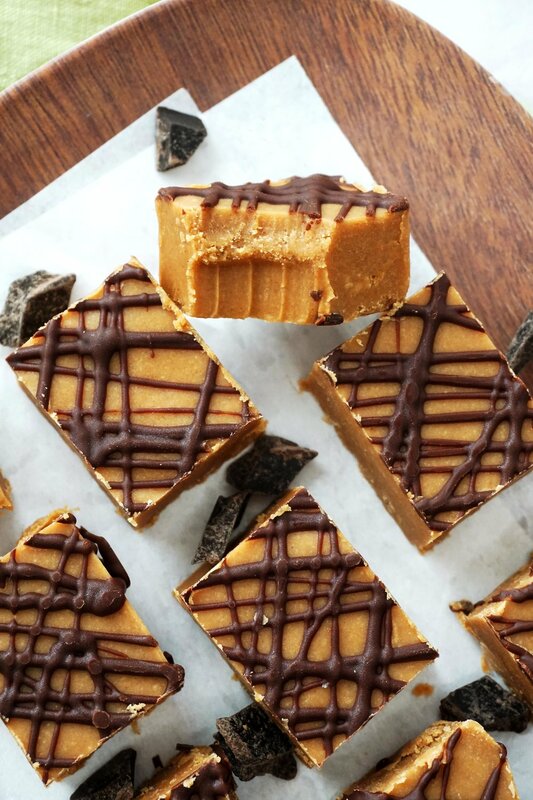 This Peanut Butter Coconut Fudge. With 5 ingredients at most, this recipe makes it as easy as melting everything together, pouring it into a pan, and cooling until solid. Then, slice and taste the simple dessert recipe of your dreams. No, but seriously. If there’s one line I hear most often, it’s something along the lines of “Ugh, but I can’t do that! It’s way too complicated and precise.” And you’re like half-correct, if you feel that way. Baking is definitely precise and can most certainly be complicated. That’s what makes baking the joy that it is in the end, when the finished product comes out of the oven (or fridge or wherever), ready to be simultaneously savored and devoured. My knowledge of baking comes from personal experience and hours upon hours of studying on my own time, no formal training. So, I know first-hand the absolute need for precision and attention to detail with, like, 99.9% of baked goods. One time, my ratio of butter to flour in a sweet bread was way off, which I realized halfway through the baking time. My genius idea to fix it was to just add in the remaining amount of flour to half-baked batter in the pan. Don’t do that. It was not genius. Another time, I tried to use all coconut flour in a waffle recipe (before I realized how much I hate that flour) and ended up with half the waffle on the top of the waffle iron and the other half on the bottom. Burnt and mushy. And for one final example, I once - once - tried a 100% whole-wheat bread recipe, but somehow pulled what tasted like footballs out of the oven. I now let the bread experts do that work for me. So, yeah. Precision. Complication. I get it, and as much as I wish we could allllllll appreciate the therapeutic art of baking, I know it’s not for everyone. Like how my organic chemistry professor wanted me to love the subject as much as he did, but I only tried hard because I wanted a good grade… and he was pretty cute, too. Like how my mom always wished I would wear cute dresses as a little girl, but I always always always put up a dang good fight, refusing to be cute. There is no browning of butter in this recipe. No accurate measuring of flour. No fear of over-mixing the batter. Just melt. Stir. Pour. Freeze. Slice. Eat. I hope you also share because this fudge is the talk of the town. Well, it’s the talk of my house, at least, but now that it’s on the blog, it can spread around town, too. In a double-boiler or microwave-safe bowl, melt the peanut butter chips, coconut milk, and 1/4 cup coconut oil until smooth. Clean the double-boiler or bowl to use it again later. Pour this into a 9x5 or smaller dish lined with parchment paper and freeze for 1-2 hours, or until firm. I wouldn’t recommend using anything larger than a 9x5 dish. Anything smaller will yield thicker, taller fudge that takes longer to firm. Keep that in mind. In the double-boiler or bowl, melt the dark chocolate chips and 1 tsp. coconut oil until smooth. Take the fudge out of the freezer and use a small spoon to drizzle the melted dark chocolate over the top. Freeze again until the chocolate has set. 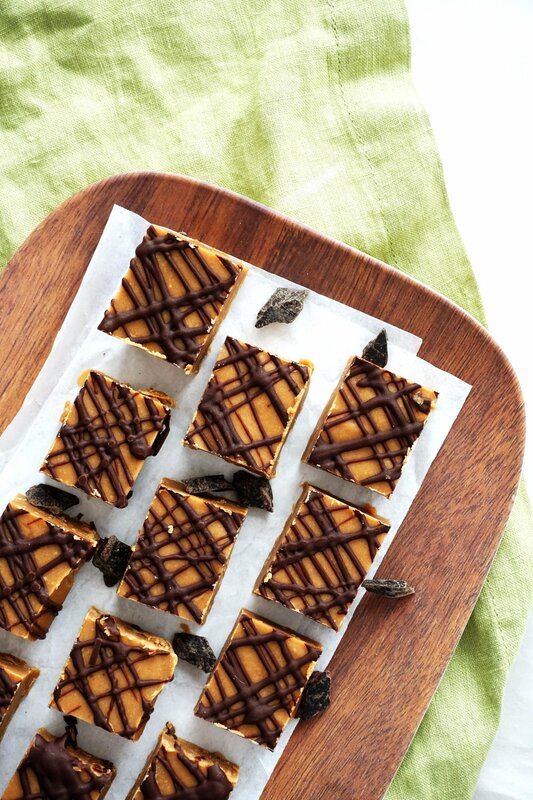 Use a sharp knife to cut the fudge into small cubes, or whatever size and shape you’d like. Serve immediately, and store leftovers in an airtight container in the fridge. It will begin melting slightly if left out at room temperature for longer than 30 minutes.